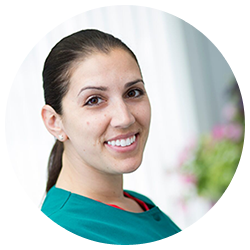 Jessica decided to become a Registered Dental Hygienist because she has always enjoyed helping people smile. She received her degree from Springfield Technical Community College and has been practicing at Welcome Smiles for 12 years. Her favorite thing about her job is the relationships that she gets to foster with her patients while helping them achieve their oral health goals. When Jessica isn’t chairside, she likes to spend time relaxing poolside with her pets, spending time with family, and travelling with her husband Angelo.